I just spent a week in the Dallas Fort Worth airport sleeping very little and playing all the things, or at least as many as was physically possible. That’s right, it’s that BoardGameGeek Con time of year, and now I’m back to tell you about all the amazing games I had a chance to try. So first up, let me tell you about Terraforming Mars from Stronghold Games. Despite being released a few months earlier at Gen Con, this game sold out within a couple of hours on the first day and was constantly being buzzed about. Finding a copy to play took patience, persistence and a little bit of stalking whoever currently had it checked out of the BGG library. Terraforming Mars tasks you with making Mars habitable, but also pits you against the other players as money-hungry corporations trying to prove that you are in fact the best at this terraforming thing. Ultimately each player is trying to earn the most points, by contributing to the terraforming parameters (increasing oxygen levels, temperature, and ocean coverage), placing tiles on the board, or by funding useful projects (cards). To help with this, you start with a corporation with a unique specialisation – one, for example, is particularly good at producing large amounts of steel, while others can generate high incomes or create greenery easily – and this will guide your strategy for the game. Each round (generation) will start by the players drafting cards, paying for the ones they actually want to keep, and then taking 1 or 2 actions at a time until everyone is out of things they can / want to do. The most common action is paying for and activating a project card from your hand, which could give you a one-off bonus, provide an additional action you can activate each round, or provide a permanent effect. For example, you could harvest some lightning and permanently increase your energy production, invent anti-gravity to make every other project you build cheaper, or (if you’re feeling really crazy) fling a giant ice asteroid at the planet to increase the temperature and ocean coverage. There are also basic actions that you can take without a card (pay x to build a city / place greenery / place an ocean), but these are more expensive than the cards that let you do the same thing. When you’re choosing what actions to take, there’s a constant need to balance improving your abilities with actually contributing to terraforming – do too much too soon and you’ll get an early but unsustainable lead on points, but wait too long and you might be left behind. You’re also trying to make sweet sweet combos that play off the strengths of your corporation and maximise your fairly limited resources to get as much done as possible. When everyone passes on actions you produce, start a new round, and rinse and repeat until all three of the terraforming parameters are maxed out. I have to say I insta-bought Terraforming Mars based on the A++ theme, because of course I want to go to another planet (Elon Musk, take me with you). Under that exterior is a fantastic game that’s definitely worth your time, even if you don’t dream of going to Mars. Building up your production engine and increasing your capabilities throughout the game is extremely satisfying, and varies from game to game based on the cards that come out. I like that your corporation helps to define your focus at the start of the game to prevent you from getting overwhelmed by the many options presented to you, while also not stopping you from branching out to other strategies. This is also a game where timing is crucial – some projects can only be played when the temperature is below a certain number, for example, or when there are a certain amount of oceans on the board – so manipulating the tempo of the round is important. I enjoy the challenge of figuring out not just what I want to do on my turn, but also when I should do it. For example, I might need to take advantage of two actions on the same turn to claim an area on the board first, or maybe stall with only one at a time until that one card I want to use is playable. There isn’t any direct player interaction, but the drafting, the need to jostle for space on the board, and the competition for end-game milestones introduced enough indirect interaction to avoid that multiplayer solitaire feel. My only complaint about the game is that some (a lot) of the card art is a bit strange, a mix of slightly comical images in a number of different styles. This is something that bothers other people more than it bothers me, and I can definitely look past the art because I love the game. And are you prepared for a segue because SPEAKING OF SPACE, I had a chance to play a prototype of Matt Leacock’s upcoming game Mole Rats in Space, to be published by Peaceable Kingdom (and yes it’s obligatory for the title to be declared in a deep announcer voice like so: Mole Rats...IN...Spaaaaaaaace). This is a cooperative kids game, coming out next year, where you’re trying to move your mole rats around the board, collect all the items you need for your great space travel adventure, and get to the spaceship. But be careful, because there are evil space snakes trying to attack you! Each turn, you draw a card that shows you which mole rat(s) can move how many spaces, as well as either moving snakes around on the board or adding more snakes. You get to choose how the snakes move though, so while you’re slowly moving your mole rats up the ladders further into the centre of the board, you’re trying to move the snakes onto the arrows and kick them further out. If you’re good, you’ll be able to position them so that they are kicked off the board entirely “where they are shot into the vacuum of space and die of asphyxiation” (Matt Leacock, 2016). I had a lot of fun playing this, so if you ever game with younger kids I’d recommend keeping an eye out for this next year. Also, seriously don’t dismiss how fun this is even for adults – I played with three other grown-ups and we got our butts kicked both times. On the completely opposite side of the spectrum, let’s talk about The Colonists from Mayfair Games. Its description didn’t grab me on BGG but it had two dedicated hotness tables at the con, so I figured why not? The general overview of The Colonists is that it’s a resource management, worker placement game. Ish. The more correct term would be worker movement because you only have one pawn to select actions with, by stepping it around a player-constructed board of possible actions (I’ll come back to that in a second). The other interesting aspect of the game is that it spans four eras, with each era adding new buildings, new possible actions, and new workers as you progress. You can play as many eras as you want, starting from any era. Wherever you start from, you begin with a relatively simple village. You’ll have some buildings, some workers to activate those buildings, a limited amount of storage space, and some tools. From there, you’re trying to take actions that let you build new structures, generate more stuff, craft your resources into more advanced goods, and earn coins (money = shiny victory points). You can also ally yourself with embassies to specialise in a particular type of action. Now let’s jump back to how you actually select actions, because that’s what I find most interesting about The Colonists. The board starts small, with some basic action tiles and a marketplace. Each round, more action tiles will be added to the board. On your turn, you can move your pawn one space, and you must be able to perform the action you land on (which can be annoyingly restrictive if you just want to get somewhere), or you can teleport to any marketplace. This results in a nice struggle when you’re trying to accomplish something specific but the tiles you need are on opposite sides of the board, or when you’re trying to figure out the best way to chain actions together. The game rewards planning multiple turns in advance so that you can use your few movement points as efficiently as possible. Having said that, this one aspect of the game wasn’t enough to grab me. 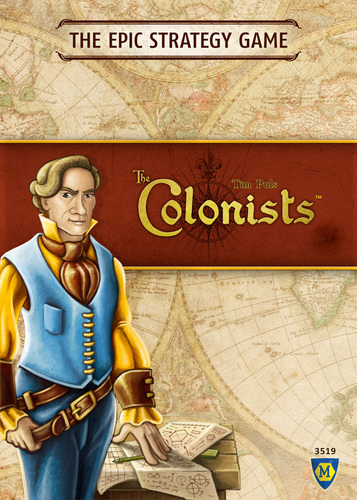 I didn’t dislike The Colonists, but I found it...generic. There are so many resource management games, and this one failed to stand out for me in any exceptional way. The Colonists is also a LONG game. Super long. We played one era (Era 2) with just two people, and it took us three hours excluding the rules explanation. Normally I’m fine with long games, and in fact I usually can’t find enough people willing to play the longer, heavier games with me. In the case of The Colonists, however, I just got bored. Yes, having to be efficient based on the board layout was interesting, and I can see how the task of ramping up to be ready for the next era (if you kept playing) is a challenge, but ultimately it didn’t offer me anything that I can’t get from a 60 minute game of Agricola. If you enjoy that style of game, I encourage you to give it a play to see if you can squeeze more out of it than I did, but it’s definitely not one I’ll be running back to. Continuing the theme, how about A Feast for Odin by Z-Man Games? This is the latest Uwe Rosenberg game, and let me tell you it is a BEAST. It’s his largest game yet, meaning yes the box is bigger than Caverna. It has almost one thousand components (935 to be exact), and a playtime of 2-3 hours. Now before you say anything, I bet I know what you’re thinking: “Oh, here we go, not another Uwe game with resource management and worker placement. How many of these do we need?” But stay with me for a paragraph or two because this game is actually excellent. A Feast for Odin puts you in charge of a budding Viking tribe looking to expand their resources, territory, and wealth. Each round, players allocate their Vikings to different action spaces on a central board, with more advanced actions requiring more workers. You can do things like earning goods, purchasing ships for fishing or raiding, exploring to claim other islands, and upgrading goods you already own. I know, all of this sounds very standard, but the interesting part is that the items that you’ll be acquiring or upgrading are differently sized tiles that you need to physically fill up the space on your home board. Every player board has a grid with some money icons, some resource icons, and many many negative points around the edge, and during the game you’ll be trying to fill your board in particular ways. For example, completely surrounding a resource icon provides you with one of that resource every round (but is fiddly to do), while building your board outwards from the lower left corner allows you to increase your income. Both of these are useful during the game but they don’t deal with the pesky -1 squares along the edges, and every one of these left uncovered counts as a negative point at the end. Just to throw another spanner in the works, certain types of goods can’t be placed adjacent to each other, meaning you’re not just trying to get tiles that are as large as possible but also a variety of tiles that can actually be placed together. Oh, and it’s still a Rosenberg game after all, so don’t forget to feed your Vikings. A Feast for Odin is one of those great games where every individual action is simple to understand, but figuring out how to combine those actions into a coherent strategy is a complex task. It’s also not a game with a single way to win – the large action space (>60 options) allows for players to figure out and use a variety of strategies. Then you have the challenge of figuring out how the HECK you are going to tetris all your pieces together, the panic as the end of the game approaches and you still have all your -1 spaces uncovered, the choice every round of taking a couple of complex actions or many smaller ones...there are so many things to consider and I love it. My main concern before I played it was that there wouldn’t be any player interaction. There isn’t much, but there’s definitely a surprising amount of tension in the action selection in terms of competing for certain spots and being able to block other players. I really enjoyed my play of this, and it’s now (tentatively) my second favourite Rosenberg game after Glass Road. I definitely recommend that you check it out, especially if you enjoy spatial puzzles. Now let’s jump from our centuries past to the futuristic city of New Angeles, a place where mega-corporations rule and you can’t quite trust anyone. New Angeles is an upcoming release by Fantasy Flight Games, and it’s a game of hidden agendas, bargaining, and backstabbing. As a mega-corporation, obviously your first priority is to keep the city running and the civilians happy – how else are you going to profit off them? Everyone has to work together to meet specific production goals and deal with the threats on the board, such as power outages, disease, strikes, and enemies. If these are left unchecked, the threat level in the city will slowly creep up up UP, ending the game if it gets too high. To manage all of this, players will propose actions using cards in their hand, make counter-proposals, and vote on what they think is best for the city. So far this all sounds very amicable. Isn’t it lovely how mega-corporations have learned to work harmoniously with one another? Well, let me show you the seedy underbelly that is the true New Angeles. Every mega-corporation is given a random rival, and you only win if you manage to earn more capital than them by the end of the game. There’s also a Federalist rival card that may or may not be in play, and that person just wants to watch the city burn (once they’ve accumulated enough profit for themselves of course). 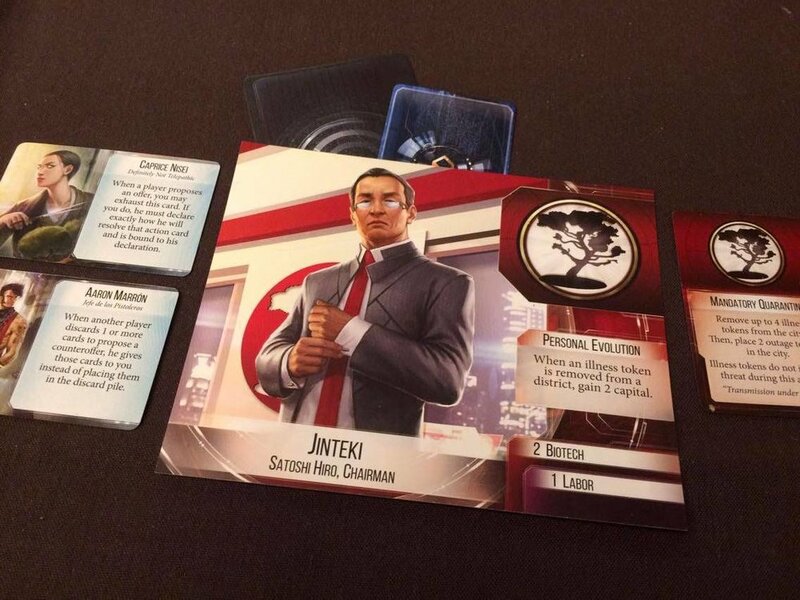 Everyone also has temporary investment cards that earn them capital depending on the state of the board, so every turn you need to consider how the proposed actions will impact your personal agenda, and what your opponents are trying to do. Does Globalsec really think that solving the power outage is important, or are they just saying that because they’re profiting off the disease in the city? How do you distract the others from all of the strikes and persuade them that you actually need to focus on decreasing the threat level right now? Figuring out the other players’ incentives and goals is mind bending but also so much fun. New Angeles was not on my radar at all until I played it, and I was genuinely surprised by how much I enjoyed it. I usually dislike semi-cooperative games, and games that heavily feature negotiation, but New Angeles pulled it off in a really interesting way. The fact that everyone had a unique hidden agenda avoided the one versus many dynamic that I often dislike, and the addition of the changing investment cards meant that everyone was forced to constantly re-evaluate and shift their alliances with the other players. I’m keen to play New Angeles a few more times because it feels like a game that will reward being familiar with the cards. It would also be good to experiment with the types of negotiations that are possible, such as trading capital, assets and other resources between players to make a deal (we were playing very late at night, so we were all slightly tired and not properly switched on to the bargaining side of things). My main concerns at the moment are how long it takes to play, and the minimum number of players – 4 hours is very long for this type of game, and requiring at least four people is likely to make it a lot harder for me to get it to the table. It definitely left a great impression though, so my hope is that it holds up after more plays. And now for the grand finale, the highlight of my BGG.Con 2016. 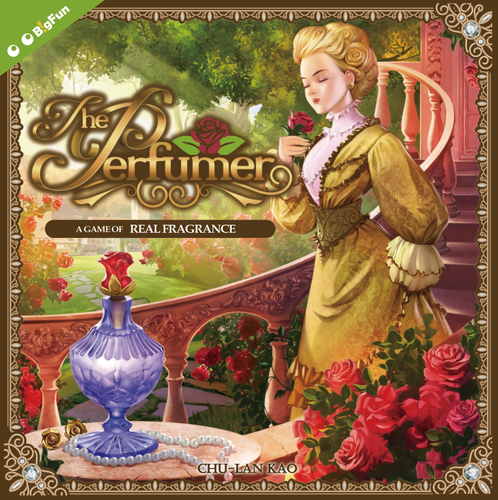 Step right up, ladies and gentlemen, and let me tell you about the incredible scratch-and-sniff board game, The Perfumer by Big Fun Games. Yes, you heard me, this is a board game where your nose holds the key to victory. As an amateur perfumer you need to travel around the world collecting ingredients and bottling the scents for your customers to enjoy. Most importantly, you need to learn the unique fragrance of each ingredient so that you can unlock the secret to your mysterious perfume recipe, and this means actually smelling stuff. Your turns in the game are very simple – you can spend your actions moving, picking up an ingredient from where you are, or fulfilling a contract where you are by spending the required ingredients. Maybe you’ll go to Spain to pick up some lavender, fly to America for some limes, and then pop back to Taiwan to make a customer there very happy, but really never mind that because the fun of the game starts when your turn ends. Now, my friends, you get to put your sniffing skills to work. The Perfumer contains seven differently coloured “smelling strips”, each of which are randomly filled with a fragrance card at the start of the game. Every place on the board also has a scented card matching the ingredient you find there. To solve your secret recipe, you have to do some clever nostril deduction and figure out which smelling strip contains which ingredient. Out of the 35 unique games I played at BGG.Con, The Perfumer was easily the most entertaining. The concept is intriguing, the gameplay is more than a little bit ridiculous, and I had a blast. The scratch-and-sniff aspect seems like a very minor part of the game when you read through the rules, but it quickly became clear that a) the points it earns you are vital and b) it’s so novel and entertaining that it’s the only thing you really care about doing. The rest of the game is a fairly simple pick-up-and-deliver task that ends up being treated as a side quest to deducing the scents. You know the game is truly afoot when someone ends their turn and all you can hear is a deep inhale as they desperately try to figure out which fragrance they’re holding. This is definitely a game you need to play with a group that won’t try to take it too seriously. If you treat The Perfumer as an efficiency-maximising Euro game you’ll have a terrible time, because the actions you do on your turn are not all that interesting. If you focus on the fragrances and play up the comedy you’ll be hitting at what I think is the true heart of the game, and I bet you’ll have a fantastic time. 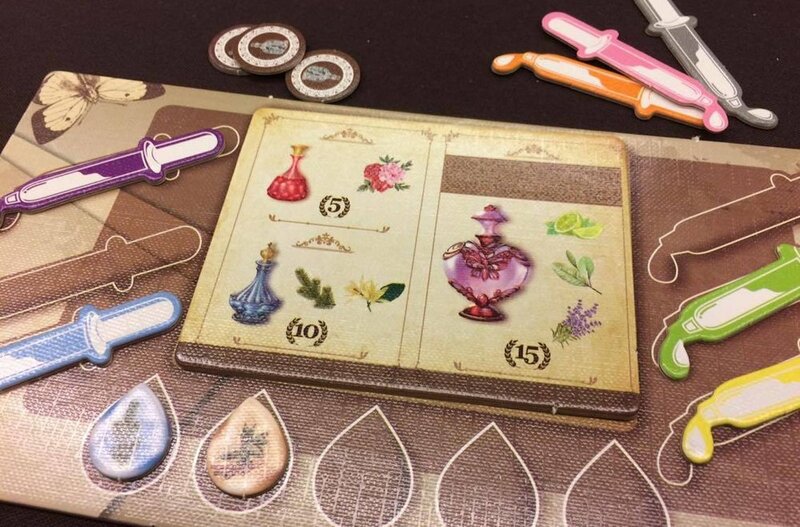 My one complaint about The Perfumer is that it has very limited replayability, because after 3-4 games I’m certain that I’d be able to remember what each ingredient smells like and eliminate the need to do any deduction on future plays. Even on a first game, there are some smelling strips that you’ll just know without needing to compare to the fragrance cards on the board – the rose is unmistakeably rose, for example – and every further play will make it just a little less interesting. Maybe don’t add this one to your collection, but please play it if you get a chance. You won’t be sorry. I played many other games at BGG.Con, but the ones above are my personal highlights!